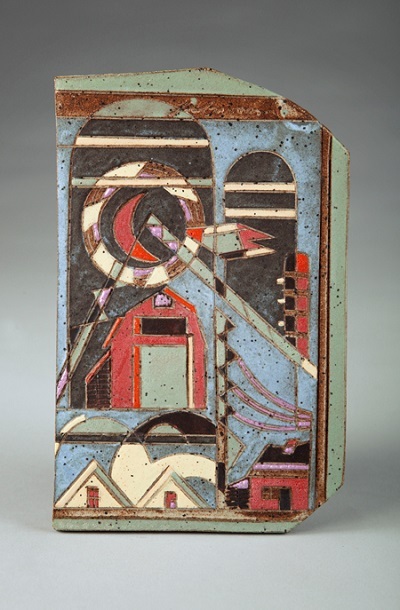 This week the Daily Palette is celebrating Marvin Cone on My Mind: The Ceramics of Dean Schwarz, an exhibition at the Cedar Rapids Museum of Art (CRMA). This show is on view through November 2, 2014. Dean Schwarz was born in Cedar Rapids, Iowa in 1938. He studied at Iowa State Teachers College (now the University of Northern Iowa), and after earning an MA there in 1961 he continued his study of ceramics by visiting pottery studios, both in this country and in Japan. Schwarz took his pottery skills to Luther College in Decorah, Iowa, where he developed the ceramics program and taught for more than twenty years. He also founded South Bear School, a private arts school in Decorah, and helped to establish South Bear Press. As a potter interested in the ceramic work of other cultures, Schwarz traveled widely. He visited Panama and Germany, and he was awarded a Fulbright Fellowship in 1971 to study ceramics in South Korea. Marguerite Wildenhain, a Bauhaus potter, was an important influence on Schwarz's work. Schwarz has received many awards for his pottery and his art can be found in collections throughout the world, such as the Pottery Museum in Mikawachi, Japan, the White House Collection in Washington, D.C., the National Gallery of Zimbabwe in Africa, the University of Nottingham in England, as well as many museums and universities in Iowa. Marvin Cone on My Mind: The Ceramics of Dean Schwarz considers the influence of the paintings of Marvin Cone, another Cedar Rapids-born artist, on Schwarz's work. The CRMA explains that "It was during his youth in Cedar Rapids that he first became aware of the work of Marvin Cone. Recently, Schwarz has created a distinct series of pots inspired by Cone's paintings. This exhibition pairs many of Marvin Cone's paintings with several of Schwarz's pots, creating a unique conversation between the two media and the two artists." Photo: Harry Baumert, Minneapolis, MN.